A book of fun: Game On! – Joyce's mystery and fiction book reviews with some non-fiction too! 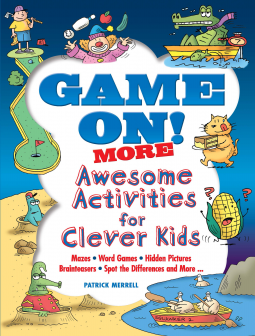 A book of fun: Game On! I see this book and immediately think…Perfect for kids for car trips or plane trips or for waiting in doctor’s offices…you get the idea. This book contains a variety of puzzles that kids should find quite fun and amusing. There are mazes, word games, jokes, spot the difference puzzles, word searches and more. It is the sort of book that I adored when I was a kid. I even want to do the puzzles now. Highly recommended. Thanks to NetGalley and the publisher for this fun puzzle collection.